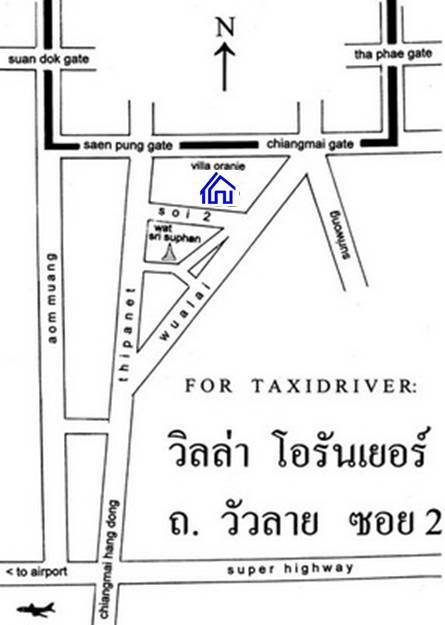 Location Villa Oranje Chiang Mai. 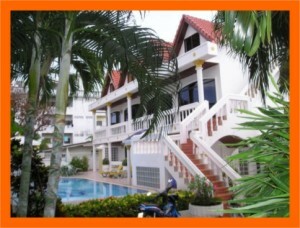 Dutch Hotel Thailand. 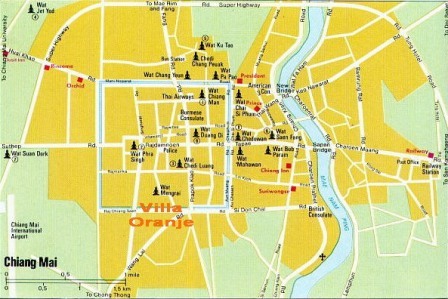 Villa Oranje is located just south of the old city center close to the Chiang Mai Gate. A unique location close to Wulai Road is the so-called 'Silversmith Street' of Chiang Mai. The street is perpetually ringing with a cacophony of sounds of silver beating. In the back of the silverware shops that line the road, the silversmiths pound away fashioning cigarette boxes, bowls, trays and other accoutrements always much in demand as household items of northern well-to-do homes. There is also a rising market for sculptured silver panels of jungle scenes, and increasingly aluminum panels are being crafted in the same way as silver panels. Chiang Mai is further characterized by being one of the world’s largest centers of cottage industries. Numerous handicrafts are traditional to the region and craftsmen, using skills passed down from generation to generation, continue to produce marvels is silverware, lacquer ware, celadon pottery, silk and cotton, hand-painted paper umbrellas and more. Warorot Market (Kad Luang). North of Nawarat Bridge and west of the Ping River between Thapae Roads and Chang Moi Road, this sprawling outdoor market is where the locals shop, and is well worth a visit for those who enjoy shopping for fabrics, clothes, herbs and spices and hard to find items. It also includes a beautiful flower market and fruit, and out of this world fireworks stands. Chang Klang Road is the setting for the famous Night Market of Chiang Mai. From around 5 p.m. until late in the evening lots of merchants open stalls on the sidewalks and display their goods: clothes, purses, suitcases, hill tribe jewelers, all kinds of lacquerware items, carved wooden animals, etc. We are able to provide you with tailored to your specific needs city trips, day trips and walking arrangements either in the city or in the outdoors with the possibility of a multiple stay in the jungle where you will be able to meet the people from the Hill tribe Villages who have lived in the mountains since ancient times.